What are Different Moving Boxes for? 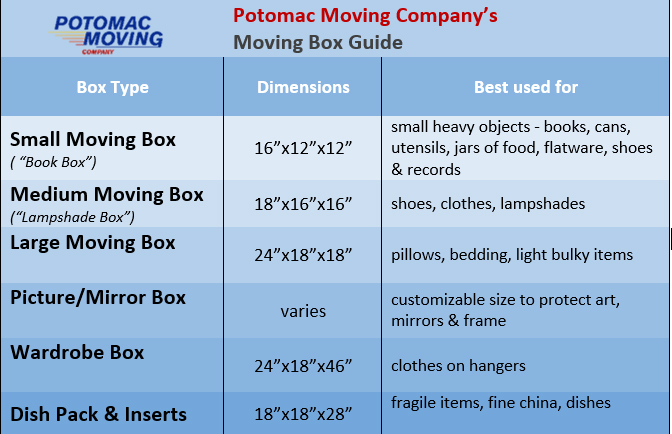 Potomac Moving CompanyMoving BlogMoving TipsGuide to Moving Boxes – What are Different Moving Boxes for? Standard moving boxes come in several fixed uniform sizes. Using uniformly sized moving boxes will save you time and money by making your move go smoother. They are easier to stack inside the truck too, which prevents breakage of your valuable items inside the boxes. Here is our guide to help you better determine the appropriate box size and type for various items. Following this guide will help properly protect your belongings, as well as save you time and money by making the loading, stacking and unloading process much more efficient. The ultimate rule of thumb to remember is – the heavier the item, the smaller the box! If you have any questions about purchasing moving boxes or about packing for your upcoming move in general, give us a call here at Potomac Moving Company at 888-505-3385 and get honest, straightforward advice from our professional, experienced and down right awesome team! Happy moving! Potomac Moving Company offers a wide range of competitively priced packing materials. We carry all sizes of professional uniformly-sized moving boxes, specialty TV and mirror boxes, as well as other packing essentials such as packing paper and bubble wrap, paper pads, packing tape, shrink wrap and more. With us, you don’t have to be afraid to over-bye your supplies – we’ll pick up and refund you for any unused extras (that you have purchased from us) after the move. Call us today to order your packing supplies or shop online now! Happy moving!